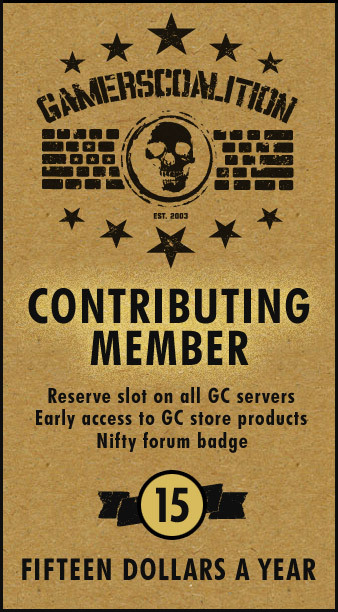 This gives you access to GC-only forums, a voice in GC decisions, early access to new stuff in our storefront and the all-important reserve slot across all GC servers. If you are buying a membership for someone else, please purchase a gift certificate for them instead otherwise we can't track their membership (and reserve) all that well. Do not purchase a membership if you are intent on swearing, harassing admins, or other nonsense. A contributing membership does not give you permission to do what you like. We WILL ban you and keep your money. Start your own servers if our standards are a problem for you. 1) You *will* be held to a higher standard than regular players. A GC membership doesn't let you bypass our rules. We actively hold our contributing members to a stricter interpretation of our rules. You represent us - you *are* us. Don't let us down! 2) We *NEED* your Steam_ID! We accept PayPal as well as credit/debit cards through our Stripe account. Your reserve should appear within 24 hours of confirmation of funds; often times less. If there is a problem we will PM you. If, for some reason, you don't need/want a reserve on our Steam servers just enter whatever you like when asked for your Steam_ID. Renewal invoices generate a week or two before your year is up. Pay the invoice to keep your reserve intact or you can let the invoice lapse. Your choice, and thanks for supporting GC! I don´t know why not exists more reviews about the memberships but, in my opinion is a wonderful & strong form to say to all the regular players which they should think seriously on buy this, because hats, more fun, server full?? Kick & claim your 15 bucks, be proud about you, me. We are on GC must teach & represent well. Great and you get reserved spots! I bought a membership and ever since then it's been like redbull. It gave me wings. I joined but I kept getting kicked ..